Cellist Yo-Yo Ma and artist Theaster Gates, in a conversation moderated by Logan Center for the Arts Executive Director Bill Michel. At most times of the day, the area around Washington Park’s Garfield Green Line station is characterized by a solemn stillness. Lined with boarded-up storefronts, the streets boast few pedestrians, save for those shuffling off a sporadic stream of buses. Only whizzing cars and, occasionally, the tectonic rumble of trains overhead break the quietude. Thanks to a collaboration between the University of Chicago and the Chicago Symphony Orchestra (CSO), however, another sound—albeit an unlikely one—will soon pierce the silence: the stately strains of Bach’s Brandenburg Concertos. The music will be part of this Thursday’s Bach marathon, in which small ensembles from the CSO’s pre-professional Civic Orchestra will perform all six concertos and selections from The Art of Fugue in various community locations around the South Side of Chicago. UChicago’s Arts Incubator and the KLEO Community Family Life Center—both on Garfield Street—are just two of ten community spaces that will be transformed into concert halls for the free, daylong event. 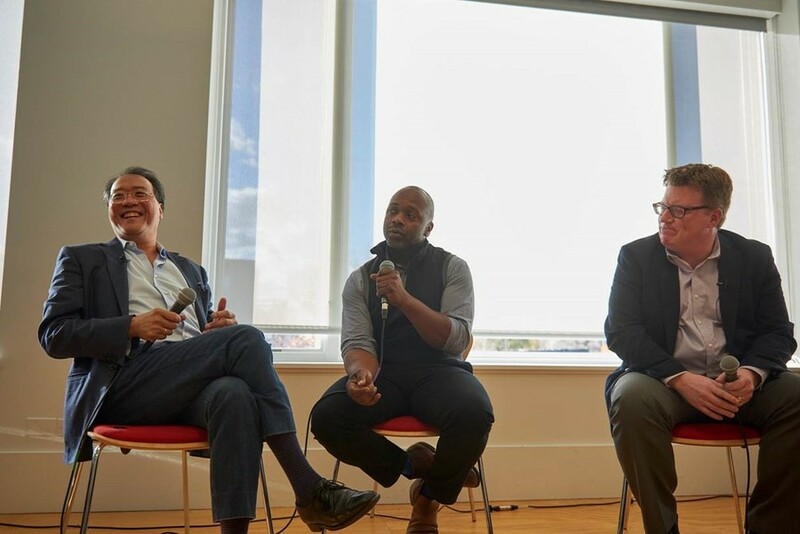 Last month, cellist Yo-Yo Ma and conceptual artist Theaster Gates—the CSO’s Judson and Joyce Green Creative Consultant and the University’s Director of Arts + Public Life, respectively—met in the Arts Incubator before an audience of Civic Orchestra musicians, reporters, and local representatives to discuss their hopes for the Marathon. Both Gates and Ma know a thing or two about interruption. A potter-turned-urban planner, Gates is prone to speaking about social change in terms of pottery. (“I believe that things can be shaped and reshaped. Nothing’s absolute. Everything’s plastic; just heat it up.”) His ambitious projects take neglected buildings on Chicago’s South Side and reimagine them as creative spaces, the Arts Incubator being one such project. Ma himself is something of an outlier in the classical world for his blend of genre-bending curiosity and down-to-earth accessibility. During the public conversation and subsequent social hour, he often broke off in the middle of a thought to enthusiastically greet Civic musicians. Though the Marathon marks Ma and Gates’ first collaboration, the two men bantered like old friends. When Ma mentioned that Bach was “one of the greatest improvisers the world’s ever known,” Gates deadpanned, without missing a beat: “It’s ’cause he was black.” Later, an impromptu take on the famous “Flower Duet” from Léo Delibes’ Lakmé sent the men into childlike paroxysms, Ma playing air cello and Gates theatrically gesticulating. Despite these antics, their conversation was permeated with a deep thread of seriousness about the upcoming event, and, more generally, the need for an artistic dialogue between entities like the CSO and the surrounding communities. At one point, Gates asked Ma how he “hacked the system”—what made someone of his stature and fame deviate from the well-worn path of concertizing to found, for instance, The Silk Road Ensemble, or to collaborate with a street dancer for a 21st-century take on choreographer Mikhail Fokin’s The Dying Swan. Though just one brief “interruption,” Gates and Ma expressed hope that the Bach Marathon will be the first step in establishing a symbiotic guest-host relationship between the Civic musicians and young people living in the mid-South Side. Gates agreed, and pointed out that the event’s success would be best gauged by its very immeasurability. 11:30 am–2:00 pm: Brandenburg Concertos 1-6 and selections from The Art of Fugue, Christkindlmarket, 50 W Washington St.
7:00–10:00 pm: Brandenburg Concertos 1-6 and selections from The Art of Fugue, Fourth Presbyterian Church, 126 E. Chestnut Street.